Talking with Dr. Wendy Sternberg is akin to climbing aboard a locomotive fired by passion, keen observation, infinite flexibility, and selfless goals. Dr. Sternberg is the founder, through her experiences with Landmark Education, of Genesis at the Crossroads, an organization established with the central idea that art is a vehicle for peace building, being at the same time neutral, expansive, and engaging. Nearly fourteen years ago, in 1999, GATC was formed and soon granted non-profit status. Since then, it has reached out globally to create bridges between diverse peoples, bringing music, forming artistic fraternities, showcasing cultures, and offering children the chance to express themselves. Sternberg launched a series of festivals under the title HAMSA, a term given to the five fingers on a hand and a symbol for collaboration. As with many words with ancient Middle Eastern roots, ‘hamsa’ means exactly the same thing in the three predominant languages of the area: Arabic, Hebrew, and Farsi, and so, the hand was an appropriate choice and mantra for the innovative gatherings. What distinguished HAMSA from other Middle-Eastern themed events was the conscious and committed blend of Arab, Israeli, and Persian cultures throughout the festivals. One could literally travel from the Levant to the Red Sea and across North Africa with the food, wares, and music presented at the two and three day celebrations, and thousands of appreciative visitors have done just that over the years. One manifestation that arose out of the HAMSA festivals was The Saffron Caravan, an ensemble of extraordinary musicians from different cultures, nations, and beliefs. These artisans share seamlessly as they play on through a global repertoire. Their music defies boundaries and philosophies. This is arts diplomacy in action, wherein music can be neutral and creative simultaneously. Though members of the group may fluctuate with other commitments or the ability to obtain visas, frequent participants include: Irani santour player, Kiu Haghighi; Humayun Khan, from Afghanistan, a master of the harmonium and a vocalist; Americans Jean Christophe Leroy on percussion and Howard Levy on the piano. From Chicago, to Washington, D.C, and on to Morocco and Israel, The Saffron Caravan has performed and embodied the very soul of HAMSA. Yet, as powerful and popular as the festivals and performances have been, Dr. Sternberg felt a consistent pull to reach more people, to see the appreciation from the audience translate into actions taken in real life. With “One Peace at a Time”, a Chicago-based art project, she took the issue to the children. 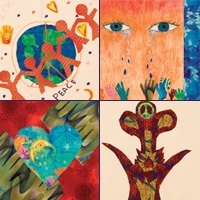 Wanting to observe how youngsters feel about peace and how they express it artistically, Wendy launched a quilt-making event with local school children. The participants came from every background and ethnic origin. Each child was given a quilting square and asked to create something that would send a message of peace and inclusion. “It’s a project to grow philanthropic kids, because I think that is what’s going to change the world,” said Sternberg. 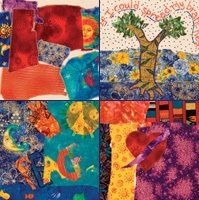 The resulting squares, filled with color, pictures, and comforting words, were sewn together into quilts by a team of experts, and, ultimately sent to children in Iraq. Now, the younger generation is again the focus, with Dr. Sternberg and her team of experts putting in place the plans and curriculum necessary for an educational academy with a mission. The Genesis Academy, which will open its doors within three years, will reflect a student body resonant of Chicago’s diversity. Wendy believes that working with people who are not necessarily like-minded forces people to take a look at creative problem solving. She witnessed such collaboration while a fellow of the Rotary Peace and Conflict Studies at Chulalongkorn University in Bangkok, Thailand. While there, she traveled with other participants to still war-torn areas of Laos and Cambodia. Groups in those regions are attempting to move past a contentious history and rebuild according to a more enlightened schema. They have had to override prejudice and grievances to deal with issues of land and water. For Sternberg, seeing communities rise above deeply felt resentments, the question became, how could she contribute to fostering future leaders who would then be available to guide the myriad of conflict-ridden locales worldwide? A school, one which reflected the world’s diversity and engaged in providing inspired educational opportunities, was her answer. To that end, the Genesis Academy will deliver a curriculum that is specifically designed to foster critical thinking, conflict resolution, planning, implementation skills, and a compassionate student body. Not every one will be sold on the same vision of peace, but every one will have a voice and know how to use effectively. At the heart of the schools philosophy will be the idea that ‘peace is generative’. Dr. Sternberg asserts that peace is not simply the absence of conflict, but the state in which positive, community building acts are possible. It does not require the blending of identities, but rather the sharing of ideas. Guided by a group of educators, researchers, designers, and others, The Genesis Academy will be a school out of the ordinary, where every student is encouraged to be a part of the process for reconstruction and the group that takes peace to the next level. Genesis at the Crossroads, a worthy project from its outset, has gone, as all great ideas should, through a variety of incarnations. Each stage has raised the ante and broadened the scope. Dr. Wendy Sternberg believes that with the first graduating class of The Genesis Academy, dozens of young minds can lend their expertise to the process and generation of peace.